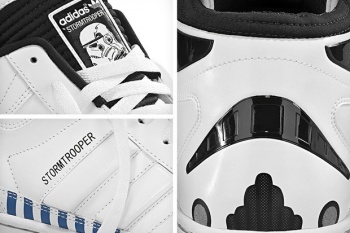 What sneakers do the best dressed Storm Troopers prefer? Adidas, apparently. Adidas has announced a new line of apparel based on the original Star Wars film released in 1977. The line is mostly sneakers, including shoes based on the Imperial Stormtrooper (pictured), Yoda and Luke Skywalker's X-wing suit, but there is also a Darth Vader hoodie in the mix. Star Wars shoes are nothing new but this marks the first time that sneakers were created showcasing specific characters and scenes from the movie. According to multiple sources, the shoes will be available in select stores in January 2010. I have to say that, at first, I thought these shoes were ridiculous, but they are starting to grow on me. The old-school feel of the classic Adidas design matches up well with the nostalgia often associated with Star Wars. My predilection for black shoes might even put the Vader shoes on my list. Thankfully, there is no trace of content from the prequels. You may insert the Jar-Jar joke of your choice here.